Soon, I will post an article in which I make a plea for interest-focused development. In that article I will explain what I mean with interest-focused development and what its advantages are for individuals and organizations. Here, I will give a preview of that article by mentioning the direct advantages of interest-focused development. When we are doing something which interests us, in other words, which we enjoy and find meaningful, we enter a psychological state of attentive engagement and we experience positive emotions. In this state we think more clearly, we comprehend things deeper and more easily and we remember better (Murphy Paul, 2013) due to which we learn more efficiently and better. Also, it is easier to sustain effort when what we are doing interests us. This is so because the positive emotions we experience while we are doing interesting things cause our energy and resources to be replenished. While we are working hard on something which interest us we are gaining energy. 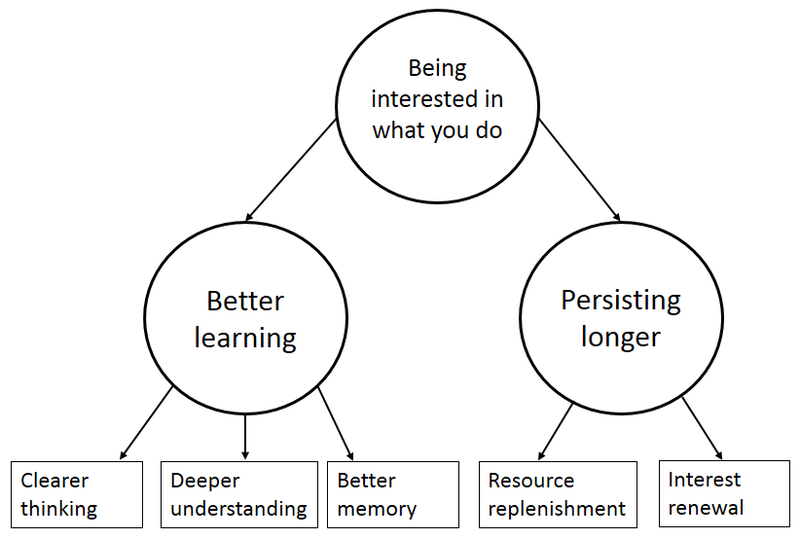 This process is called resource replenishment (Thoman, Smith & Silvia, 2011). This is an important advantage of interest-focused development because building expertise generally requires much persistence. In addition to these advantages, there is another important advantage of interest-focused development. Research shows that, when we follow our interests, a mechanism kicks in which causes our interests to be automatically excited or renewed (Silvia, 2008). This process works as follows. When we find a topic interesting and we immerse ourselves in it, we encounter new information. Part of this new information will fit well with what we already knew about the topic. But another part of this new information will, to some extent, be at odds with what we already knew or thought we knew. This new information thus creates a certain conflict which we will want to solve or an information gap that we will want to overcome. While following our interest, our interest will thus naturally evolve and renew itself. We might call this interest renewal. Such a focus on interest has both advantages in the short and in the long term . In the short term, the advantage is that people will be more engaged in their work. The literature on work engagement shows that employee engagement is associated with various benefits. For example, engaged employees tend to be more creative and more satisfied with their work and perform better (Bakker & Daniels, 2012). Research by Amabile & Kramer (2011) has shown that making progress in meaningful work is one of the most motivating things for employees in creative professions. What is is important, according to these authors, is whether you feel that your work contributes to what is valuable to you. Their word 'meaningfulness' is closely related to the word 'interest' which refers to what engages our attention or concerns us. In the long term, the advantages may even be greater. Much research has demonstrated that achieving expert performance across a range of performance domains requires many years of focused attention (Ericsson, 1996; Ericsson et al., 2006). The essential way to become excellent in something is to immerse oneself deeply in it for many years. How one can accomplish that is thus the key question. 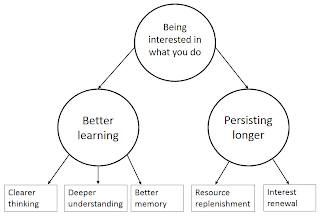 The above-mentioned advantages (better learning, resource replenishment, and interest renewal) make it much easier to persevere in the development of expert performance. An investment in something which is less interesting is not only harder to sustain, one can also wonder whether it is worth the trouble at all. To speak with David Maister (1997): "Success comes from doing what you enjoy. If you don’t enjoy it, how can it be called success?" Maister, D. (1997). True professionalism. Free Press.